New LED fixtures improve visibility for nighttime travelers while cutting costs for taxpayers in Baytown, Texas. 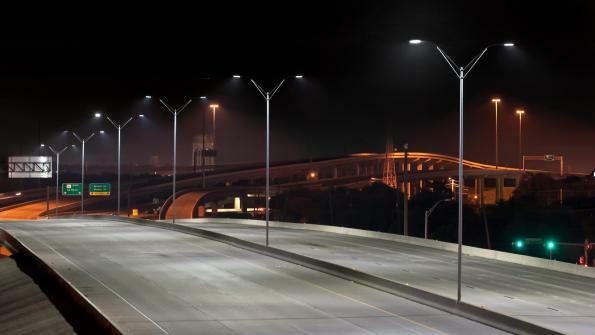 Baytown, Texas, was concerned with increasing nighttime visibility with improved highway lighting for its motorists, while seeking a way to lower highway maintenance and curb city expenditures for taxpayers. Cree LED streetlights in Baytown were first installed on state highways and were an upgrade over previous high pressure sodium fixtures, which did not illuminate the roadways as efficiently as LED counterparts. The sodium fixtures also tended to burn out within two years of use, resulting in the need for frequent replacement that further compounded high maintenance costs. Six 400-watt high pressure sodium fixtures on three light poles along Highway 146 at the Garth Road overpass were replaced with the LED luminaires and observed by city management and the Houston transportation operations division of the Texas Department of Transportation (TxDOT). For three months prior to installation of the LED test fixtures, the city monitored existing high pressure sodium lights for energy consumption and lighting levels. In less than a month, the new luminaires showed measurable benefits. Officials from Baytown reported to TxDOT that replacing the remainder of the city’s highway fixtures would result in cost savings that could be replicated on highway lighting throughout the state. Additionally, work crews often must close lanes while relamping traditional street light technologies, resulting in traffic slowdowns and dangerous conditions. The new street lights are tested to provide up to 20 years of use while maintaining the same quality of illumination. Escalating operational costs and decreased revenue have forced U.S. municipality managers like Baytown Purchasing Manager, Drew Potts to implement scalable cost-saving initiatives. Potts found that the street light installation provided flexibility of operating and capital expenses, creating an opportunity for redistribution of funds toward other high-priority projects. Because of the annual energy savings and lower re-lamping and labor maintenance costs, the city has not had to cut back in other areas. The targeted illumination performance delivered by the new lighting is visibly apparent and has motorists, including the city’s law enforcement, remarking that the highways are now well-lit, presenting safer nighttime conditions. All feedback about the appearance of the new lighting has been very positive including that there are no longer any shadows.